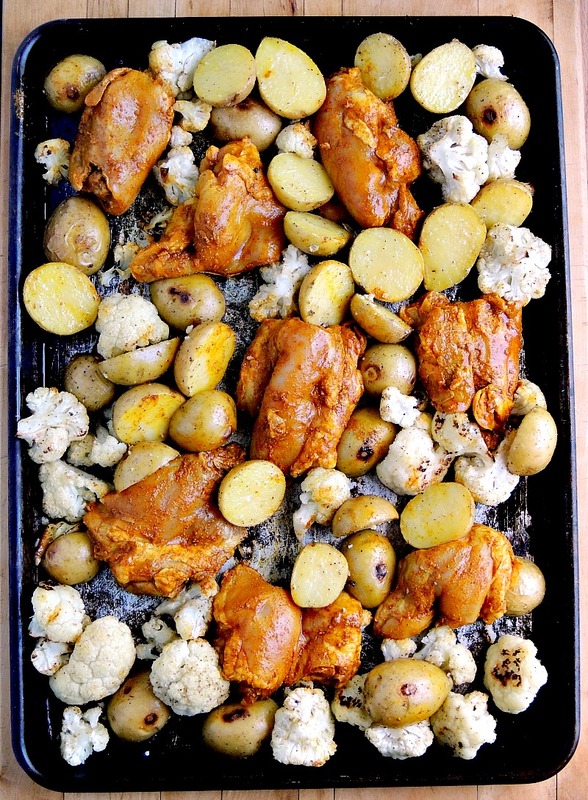 Sheet Pan Chicken Shawarma - Take a trip to the Middle East, without leaving home, with this delicious sheet pan chicken recipe. So we are finally moved into the new place. Yay!! I am still living in a sea of boxes, but we are here, and after living on take-out for the last week I was really looking forward to cooking in my new home. 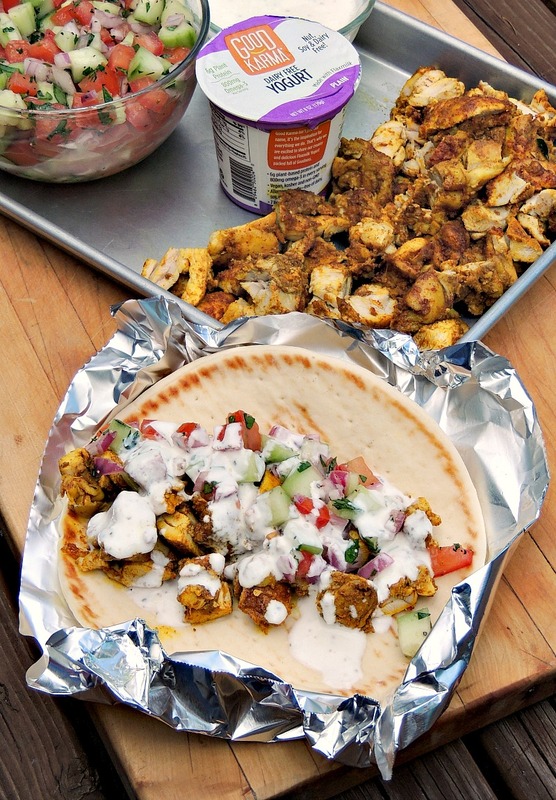 I had developed the recipe for this Sheet Pan Chicken Shawarma, and was dying to make it for the family. I knew it would be great to only have one pan to clean, and wanted a break from all of the boring meals we had been eating. Then I tried to fit my sheet pan into the oven. Let me go back for a sec. The house we bought is a fixer upper. It was built in the 70's and needs a LOT of love. But, it is our place and I love that. Although it seems that in the 70's they used much smaller ovens. Think Easy Bake oven on steroids. So, plans for the meal got put on hold, and I made arrangements to go to my son and daughter-in-laws' house to use their oven. They of course agreed. Free food is a great bargaining chip. My daughter-in-law was also very interested in learning this recipe. She really wants to learn how to cook, and sheet pan meals are a great place to start. She was a little nervous about the list of ingredients. I assured her that it might look like a lot, but it really is very easy. It is just a few spices, a bit of chopping, and then you let everything get all nice and yummy while it marinates in the fridge. Then you pop it onto a sheet pan and WALA. My daughter also joined the gang for dinner, but she can't have dairy. Not since I found Good Karma Yogurt. It is soy, nut, and dairy free. Bonus - it has 6 grams of protein, 800mg of Omega-3's, and taste great. As a Mom, with a young daughter, that would gladly live on ramen, finding something she likes that is also good for her is a total win/win. 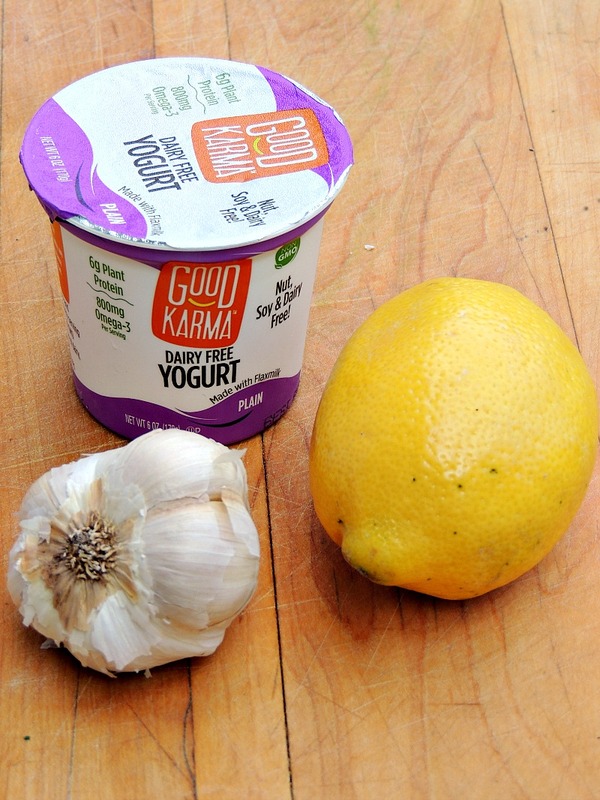 Good Karma also has drinkable yogurt, which is next on my must try list, and flaxmilk. I used yogurt in the marinade, and in the Yogurt Sauce (riata). 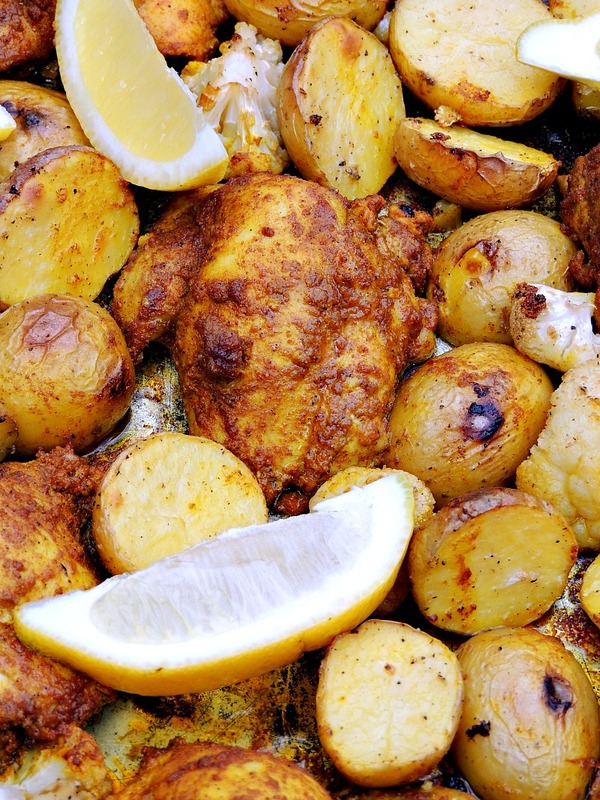 Yogurt helps breaks down protein, making chicken and steaks moist and tender, but doesn't give you that super sour taste that a lemon marinade can have. Also, lactic acid is a much milder acid, so the chance of "over marinating" (making the meat mushy) are slim to none. Everyone was in the kitchen while I was getting this into the oven, and comments were made about how good it looked. Then everyone wandered out on the deck to grab a beer. When the time finally went ding, they all came rushing into the kitchen. There were a ton of oohhhhhhs and ahhhhhhhhs, and I had to smack a few hands. They seem to forget that Mom is a food blogger and photos must be taken before they eat. Now, shall we discuss how delicious this is? OhhEmmmGeeee! I was sure it would be good but had no clue that it would be this good. My daughter-in-law loves our local Indian restaurant and said this is as good as anything she has ever had there. Gotta say that made me smile. My son took a picture of his sandwich and sent it out as a group text to all of his friends. Requests for delivery started coming in. Ummm no, I don't deliver. But I will cook for you if you let me use your oven, and do the dishes. 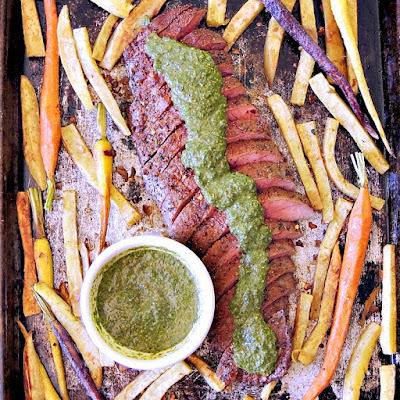 Take a trip to the Middle East, without leaving home, with this delicious sheet pan meal. In a medium bowl, combine the cucumber, tomato, lemon juice, red onion, parsley, and olive oil. Season with salt and pepper and stir to combine. Cover and place in the refrigerator. Combine all of the sauce ingredients in a small bowl, cover and refrigerate. In a small bowl toss the vegetables with the olive oil, cumin, and salt. 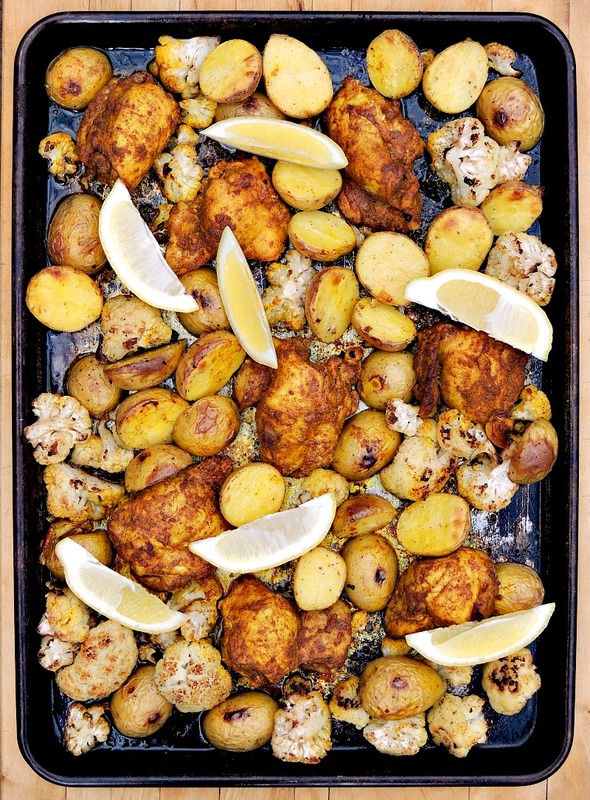 Scatter the vegetables on the baking sheet and roast for 20 minutes, then toss the potatoes and cauliflower with tongs to ensure they’re cooking evenly, nestle the chicken thighs into the vegetables, and return the pan to the oven for 20 minutes more until chicken and vegetables are cooked through (chicken should reach an internal temperature of 165 degrees). Allow the chicken to rest 5 minutes, then cut into bite-sized pieces. 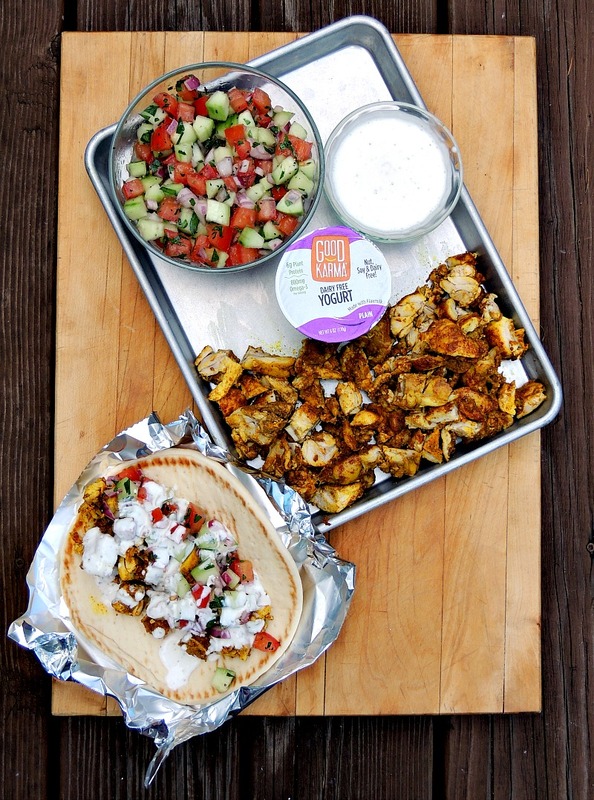 To make the wraps, warm the pita rounds in the microwave for about 30 seconds, then spread some hummus over each one, spoon about 2 or 3 tablespoons of relish, add the chicken shawarma, drizzle with yogurt sauce, top with feta cheese, and serve. 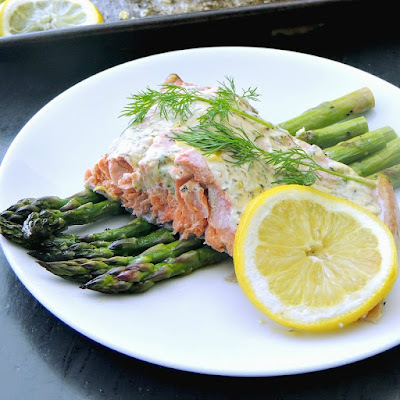 Looking for more easy and delicious meal ideas for your family? 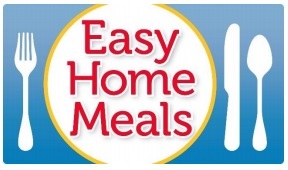 Make sure to check out Easy Home Meals, and follow their blog, and social media channels. this seems easy, tasty & i love the idea of using the greek yogurt - i recently tried making chicken salad with it too & loved it so this was perfect timing seeing this recipe! Yay! I hope you get a chance to make this! Love this!!! This looks so easy and perfect for summer!!! Will definitely have to try this recipe out!!! Great post!!! Thanks so much Tessa! I am so glad you like the recipe, it is soooo good!! Oh, I LOVE chicken shawarma but I've never made my own. I cannot wait to try this! Thanks for the great recipe! This looks absolutely amazing! It looks easy enough for me to do! I will try it this weekend! This is making me DROOL! Those roasted veggies look ridiculously crispy! Thanks! Yes, I love just about any veggie roasted! Yum!!! 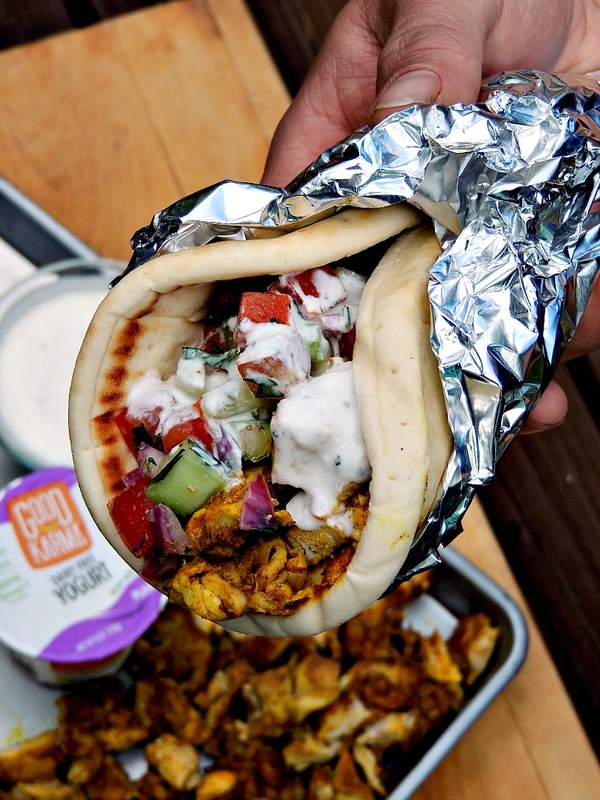 That chicken looks so incredible in the pita. I need to make this ASAP! Yes yes yes you must Sharon!! 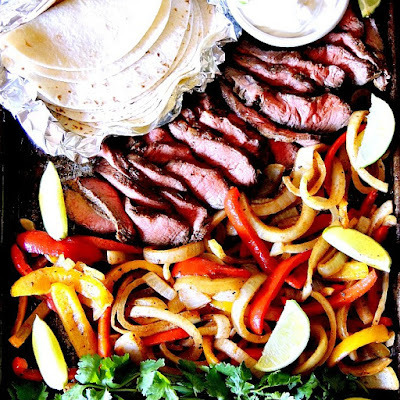 Not only does this recipe look easy to make, as always your photography is out of the world!! Ive never had shawarma, but it looks so good. Adding this to my recipes to try. Yay!! I think you will really like it! This looks amazing!! I will def have to try this. Its different. Don't mind me... I'm just drooling all over my keyboard! this looks absolutely delicious! Can't wait to try! Hehe I have had those drooling moments ;) glad you like the recipe! You make this look so easy! My goal this summer is to cook the things we usually go out to eat and gyros are one of those things we crave! Ohhh, yummy!! This looks so easy and so delicious. The chicken...and the pita bread. Nice! I've never of making Chicken Shawarma at home. After reading this and your simple recipe...I have no more excuses!! Thanks so much! I know what you mean about not thinking of making it at home. But we have a place in town that sells these sandwiches and I was determined to figure it out ;) I think they are pretty ding dang good! This is such a delicious recipe! It makes me hungry suddenly !!! For someone who totally depends on recipes, this one is super frustrating. There are things in the ingredients list that never show up in the directions (just how much yogurt and for what? ), things in the directions that aren't in the ingredients list (cinnamon? ), and things in the pictures that aren't part of either (sliced lemons from heaven?). For all those of you who said this is great, which of them are you actually following?? I am sorry that the recipe was confusing. I try very hard to write recipes that are easy to follow. I broke each element down into sections, so if you look at the ingredients listed for each element there are amounts. 1/2 cup of yogurt for the marinade, 1 cup for the sauce. Thank you for letting me know about the cinnamon, it has been removed. The lemon wedges were garnish to echo the lemon juice and zest in the recipe, but not necessary. I have included them as an optional garnish. I hope that clears everything up. OMGeeeeeeeeeee! Bobbi,This looks amazing!!! I bet it smells amazing also! You list yogurt in the marinade ingredients, but don't say in the instructions when to add it. Does it go into the bag with all of the rest of the ingredients, or get added later? Hi Saralyn, I am sorry I missed adding that. Yes it goes in with everything else for the marinade. I will fix that now! I just made this and the flavor of the chicken is out of this world! Thank you for this fabulous recipe! Oh that makes me so happy Sara. I know my family loves it but it is nice to hear that other people do as well! I'm interested in trying your recipe and have read through it a few times to be sure of the steps, etc.etc. 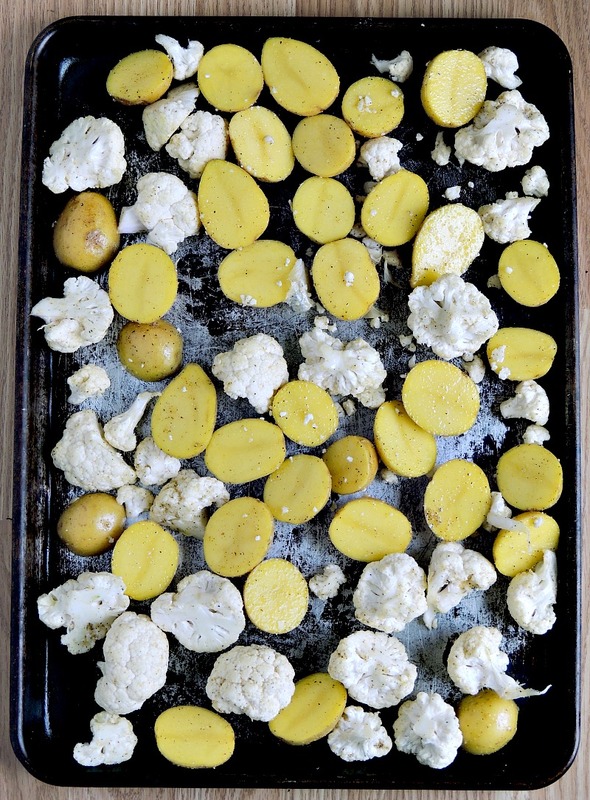 Are the cauliflower and potatoes just a side dish? I see how to cook it but don't see what to do with it in the final directions for serving. Also, you mention hummus at the end but it's not in the list of ingredients. Do you have a recipe for hummus? Thanks. Hi Suzette, I am sorry if the directions were a bit confusing. Yes, the veggies are a side for the shawarma. You could chop them and put them in the pita but I like as much of the chicken as possible in there :) You can use store bought hummus if you like. I have a few different hummus recipes on the blog but I do not have just a plain hummus. If you go to the top right and enter hummus in the search field you will see what I have available. I hope you enjoy!! Making this tonight....and my mouth is watering already.